The smear campaign against the Bolivarian government is gaining momentum as the Venezuelan election is drawing near. The propaganda attack based on the story about ‘President Maduro’s relatives’ involved in drug trafficking initiated by US special services ended up in failure. There was no evidence to go upon. Now the opposition has become even louder raising hue and cry about the ‘misdeeds of Maduro’s bloody regime’. One of opposition leaders was killed during a pre-election meeting in the state of Guárico in Venezuela's central plains. For government opponents the tragedy was heaven sent. On November 25, a man was gunned down in Altagracia de Orituco. It was Luis Manuel Díaz, a leader of the opposition Democratic Action party in Guárico. The meeting was over when shots were fired from a passing car. Dias was shot several times and fell on the floor near the makeshift wooden pulpit. People rushed away in panic, police officers guarding the town hall meeting failed to chase the perpetrators in hot pursuit. Dias died in a few minutes after he was transported to the hospital. Even before the law enforcement agencies had time to launch an investigation, the ‘bloody Maduro regime’ came under powerful attack accused of involvement in the crime. 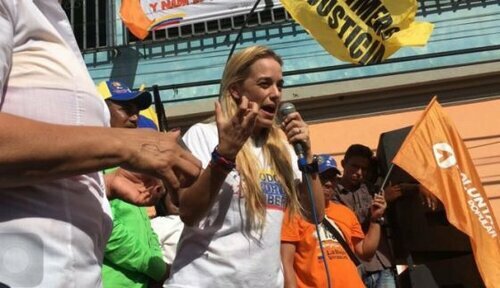 Lilian Tintori, the wife of the jailed opposition leader Leopoldo Lopez, bent over backward to add fuel to the fire. She had come to Guárico from Caracas to support the candidates from Democratic Unity Roundtable Party (the Mesa de la Unidad Democrática – MUD). Tintori tweeted that there was a double attack in Altagracia de Orituco. There were 10 gunshots close by. Blood splashed on her. She believed it was a case of state terrorism as the government was involved in an attack against the entire Venezuela. When Tintori arrived in Guárico, the twin-prop airplane she flew in on skidded off the runway and caught fire. She explained, «The brakes were removed, the plane caught fire because [of the emergency break action the pilot took]. If it had happened in another airport, the people in the plane would have died. There is no doubt that this was a planned event». The US special services made Lilian Tintori a face of the Venezuelan opposition after her husband was arrested in 2014 on charges of terrorist activities and murder. He incited the protests of radical groups. As a result, dozens of people, including security services officers, were dead. In September 2015 he was sentenced to 13 years of imprisonment. Amnesty International, Human Rights Watch and other international human rights organizations operating under CIA control said his arrest was politically motivated and used the «Free Leopoldo!» slogan for subversive activities in Venezuela. Tintori received ample funds for her tours across the country to expose ‘the misdeeds of tyranny’. According to her, Venezuela had never seen repressions as cruel as during this passing year. Tintori noted that today in Venezuela police and military can use weapons against citizens, there is no rule of law because everything is under the control of President Nicolas Maduro. This is the same good old song and dance performed previously by Maria Corina Machado in her propaganda attacks against then President Hugo Chavez. Washington pinned great hopes on her. But her image of ardent protester blurred as time went by so the baton was handed over to Tintori (along with funding). Luiz Almargo, the current Secretary General of the Organization of American states (OAS), did not wait for preliminary results of investigation to join the anti-Venezuela campaign. He has been Uruguay’s Foreign Minister in the progressive administration led by José Mujica, which was friendly towards Venezuela. Having become General Secretary of OAS he abruptly left behind his ‘sympathy for populist ideas’ to join those who attacked Nicolas Maduro and the Bolivarian leadership. In his comments on the death of Diaz Almargo wasted no time to state that «This [was] not an isolated episode». He said, it «occurs in conjunction with other attacks carried out against other political leaders of the opposition, in a strategy that seeks to intimidate the opposition». «The assassination of a political leader inflicts a death wound to democracy», he wrote in an OAS statement. It should be noted, that after this openly stated accusations Jose Mujica, the former President of Uruguay, publicly disassociated from Almargo saying he no longer considered him a friend. In the days of Hugo Chavez Venezuela made clear its attitude towards the Organization of American States. It believes the OAS operates under the US control and is used to impose «the will of empire» on Latin America. That’s why the government of President Maduro flatly refused to let the Organization observers into the country to monitor the December 6 election. That’s why Almargo sounded so provocative. President Maduro responded immediately to repel the lecturing on the part of OAS Secretary General. He said, Venezuela constantly comes under the imperialist attacks launched by the United States and its allies, as well as international reactionary circles pursuing the goal of devastating the country, seizing the political power and grabbing its riches. Regarding Díaz’s assassination, Maduro explained that the Minister of Internal Affairs was conducting an investigation. The President called it a case of «settling scores between rival gangs» in the region. «There haven’t been 12 hours of investigation yet and there goes that garbage, Luis Almagro of the OAS, declaring against Venezuela, against the people and the Bolivarian revolution», Maduro told the crowd. «This is all a manipulation, a lie, and that garbage Luis Almagro remains silent». No doubt, the United States State Department condemned Venezuela for what had happened. «This was the deadliest of several recent attacks and acts of intimidation aimed at opposition candidates», State Department spokesman John Kirby said in a statement. «Campaigns of fear, violence, and intimidation have no place in democracy». Probably, Kirby meant «people in masks» who shot in the air at the opposition pre-election meetings. The United Socialist Party of Venezuela (Spanish: Partido Socialista Unido de Venezuela, PSUV) said it had no, whatsoever, relation to such provocations, but opposition media regularly report such news. One of them reported that on Sunday evening in the capital’s district of Petara a dozen men wearing red shirts and masks and armed with rifles, automatic guns, pistols and revolvers blocked the entrance to stop a group of opposition. They shot in the air at least a hundred times to disperse them. Red Bolivarian shirts are regularly used by opposition to discredit the supporters of Nicolas Maduro and PSUV. 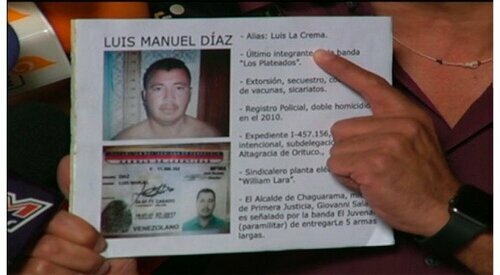 Now, who murdered Luiz Manuel Diaz? The first reports called him Secretary General of the Democratic Action Party. It’s well known that the Secretary General is Henry Ramos Allup. It’s worth to mention that he too made a statement accusing the killers from the Socialist Party without making precise what exactly position Diaz held in the Democratic Action Party. A murder of Secretary General leading one of opposition parties would have sounded as a scoop to be used by Western media. The ruling party’s campaign manager, Jorge Rodríguez, told in a TV program that politician's murder was 'settling of scores' by criminal gangs operating in the state of Guárico. Before joining the Democratic Action Party Luiz Diaz (Le Crema) had been a member of the gang called the Silver Plated (Los Plateados) involved in extortion, kidnappings and cattle rustling. Then he dealt with building infrastructure objects being a competitor of Giovanny Salazar, a member of another opposition party The Justice First (Primero Justicia). The both were standing near the pulpit. The place was guarded; there was no access to public. According to police reports, Diaz was attacked by members of the gang headed by El Juvenal, former member of paramilitary organization. Jorge Rodrigues said he was sorry that opposition leaders routinely faced critical situations due to their connections with the criminal world. Quite often criminals work as body guards for the opposition politicians. Putting the blame on the ‘regime’ opposition media turn a blind eye on the crimes committed against the United Socialist Party of Venezuela. More than ten people died. Here is the latest example. Left wing politician Eleazar Hernández was murdered on November 30 in the state of Zulia. The murder was committed by the opposition candidate at the parliamentary election Yorman Barrilla. The evidence against him is irrefutable. Barrilla is hiding. No one among those who claim to protect democracy and peace during the election campaign has ever mentioned the fact. These double standards are still in force, no matter the protests of Bolivarian government.